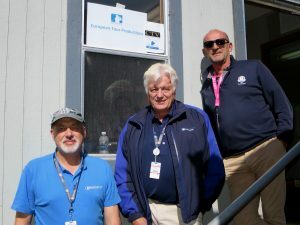 European Tour Productions (ETP) and CTV OB have a major presence at the Ryder Cup this weekend. Both are heavily involved with creating the world feed that is the backbone of the coverage of Sky Sports UK and 47 other ETP rightsholders covering 175 territories. And it is once again a case of trans-Atlantic partnership, with both ETP and CTV working closely with NBC Sports and NEP, which is providing remote-production facilities. The Ryder Cup relationship between NBC Sports and ETP/CTV can best be described as one of host and guest, with the host handling all the cabling infrastructure and managing the compound. CTV OB is calling NEP production trucks home for the event, working out of NEP ND7 (A, B, and E) and SS10B for the world feed; CTV client BBC is working out of SS23 A and B for a nightly highlights package. Production trucks on both sides of the Atlantic tend to have some differences so the CTV and NEP teams worked closely to make sure the right facilities were used. For the world feed, ETP makes use of 33 of its own cabled cameras as well as nine RF feeds, a mix of Sony HDC-1500, -2500, and -4300 cameras. Of the nine RFs, two of them concentrate on matches that are finishing up and are on hand to do interviews with players and captains. Audio is a major part of the event, and ETP has eight high-powered radio mics, two roving talent, and six roving FX mics on the course supplemented with effects mics on the RF cameras. Graphics are supplied by MST, which handles graphics for the ETP events, RF by Broadcast RF, and CP Communications is providing radios, IFB, and talent mics. The ETP/CTV production and operations team numbers approximately 230 people and will leverage much of the content created by NBC (and vice versa). He says Friday and Saturday coverage is fairly straightforward, with only four matches played at a time. Sunday gets more challenging because there are 12 matches on the course for a large portion of the day.